What Does Tumblr Being Owned by Yahoo Mean For You? This morning Yahoo announced that it reached deep into its pockets for $1.1 billion and used the cash to acquire Tumblr, the social media and blogging network. As with most big-tech-company-buys-small-tech-company acquisitions (see Facebook and Instagram) there are big questions about what will happen to Tumblr as its users know it today. Some have started to jump ship by moving their blogs over to Wordpress, while others are excited about the deal and what it might do for Yahoo. But what does this deal mean for you? We've got some basic answers below. Wait, I don't use Tumblr? I actually don't even know what Tumblr is! What does this mean for me? Okay first things first: Tumblr is a social media network or blogging network. It is made up of lots of blogs. When you log into the network you can post your own blog, follow other blogs, reblog them (or reshare them) and click a heart icon to like them. It's a fun product and it's become a hangout for lots of those Internet young'uns. There are lots of crazy animated cat photos and today animated photos about the Yahoo/Tumblr deal. Okay, I am a Tumblr user what about me? Yahoo CEO Marissa Mayer has said it a number of times today. "We promise not to screw it up." In fact, that was the subheadline in the official press release. Mayer has promised to let Tumblr operate independently. That means it won't be painting the interface purple, adding Yahoo Chat to the left rail and adding links to all of Yahoo's media properties, like this clever Photoshop creatively implies. David Karp, the CEO and founder of Tumblr, will continue to run the company. "We're not turning purple," Karp said on Tumblr's official Tumblr. "Our headquarters isn't moving. Our team isn't changing. Our roadmap isn't changing. And our mission – to empower creators to make their best work and get it in front of the audience they deserve – certainly isn't changing." Okay, I am a Yahoo user. What about me? Mayer said that the company hopes to bring some of the exciting content on Tumblr to Yahoo. "This allows us to engage both demographics with the other companies," she said on the analyst call this morning. "We can bring some of the exciting content to Yahoo or we can bring some of the users of Yahoo to Tumblr." How that will be done is unclear at the moment, but you could see how Yahoo might highlight some popular or partner Tumblr posts on its own Yahoo homepage. So does that mean nothing is really going to change? We only know what Mayer and Yahoo are saying right now, but similar to how Facebook acquired Instagram and allows it to run on its own, that really does seem like Yahoo's plan. Of course, things can change, but it seems you can rest easy right now. What about advertisements? They bought this company for a reason, right? 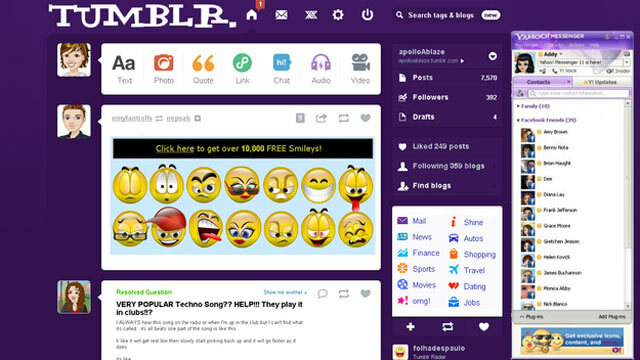 Yes, you can expect Yahoo to start experimenting with ways to monetize Tumblr. Mayer said on an analyst call this morning that she sees this as a way to "enhance offerings we can deliver to advertisers" and that she "sees it as a clear way to accelerate growth in Yahoo's core business." John Battelle has a really good article about why Yahoo bought Tumblr. He explains Yahoo's display ad business and why Tumblr's strategy of stream based ads makes sense for Yahoo. Yahoo rolled out "Stream Ads" on its own site in May. So should I leave Tumblr now like some of the others? That's up to you, but that seems like a radical move right now. Yes, some have moved their blogs over to Wordpress, but it's too early to say how Yahoo's $1.1 billion purchase will affect you. Now you tell us: Are you excited about the acquisition? Let us know your thoughts in the comments.